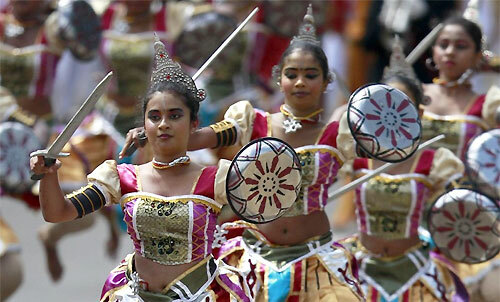 Sri Lanka today marks the 64th Anniversary of its independence, with questions as to whether there is a degree of commemoration that casts a cloud over the celebration because of what is happening or what is not happening. Some 33 months after the end of the bloody ethnic war, most analysts believe that what we have is a fragile or negative peace and we are sitting on a volcano that could erupt at any time with consequences more devastating than the terrorism of the slain Velupillai Prabakaran's LTTE. Though terrorism was militarily crushed on May 19, 2009, the cause or causes of the war have still not been addressed with conflicting views, confusion and contradictions on how to find a political solution to the ethnic conflict by meeting the grievances and aspirations of the Tamil speaking people. India's External Affairs Minister S.M. Krishna who visited Sri Lanka last month set off a major controversy when he claimed that President Mahinda Rajapaksa had assured him during talks that he would honour his commitment to settle the ethnic conflict by fully implementing the 13th Amendment and going even beyond. This is widely known as 13 plus, But the President who appears to be directly in charge of relations with India, told media editors on Monday he had only discussed the issue with Mr. Krishna and the solution would have to be worked out by the proposed Parliamentary Select Committee (PSC). The president said he would meet party leaders to request them to nominate members to the PSC though the main opposition UNP, the main Tamil Party the TNA and the JVP are still refusing to nominate members to the PSC on different grounds. For instance the TNA is insisting on continuing negotiations with a government delegation comprising members of the SLFP, the main party in the ruling UPFA. The TNA is pointing out that at least two parties in the UPFA, the JHU and the NFF are strongly opposing any devolution of power or a 13 plus settlement and are insisting they want a solution on a 13 minus basis. India which earlier worked out or virtually forced the then Jayewardene Government to enact the 13th Amendment to the constitution in 1987 is known to be backing the TNA'S claim for a 13 plus devolution of power to the provincial councils. Though we were one of the first countries in the world to obtain the privilege of universal adult franchise in 1933, we see seventy years later an alarmingly dangerous trend towards autocracy in the guise of political stability. We see the increasing lawlessness, the rule of law being replaced by the rule of men or political thuggery and intimidation. We also see the breakdown of good governance, transparency and accountability, the threats, pressure and attacks on the free media. We also see the lack of awareness and sensitivity to social justice and a widening gap between the rich and the poor. These are among the issues that need deep reflection and introspection on this Independence Day. Implementing the recommendations of the LLRC in the right spirit will create the right conditions for a solution to the national question and other issues. We hope President Mahinda Rajapaksa would rise beyond party politics to the levels of statesmanship and have the courage to make such an announcement in his Independence Day message today.